We are celebrating the 1-year anniversary launch of FoodMesh! It feels just like yesterday that I was heads down in the code of the system doing last minute checks and making sure everything was working as perfectly as possible. Now it’s been just over a year since we went live and I have seen the platform evolve from a budding idea into a blooming app. There are a few features we introduced into the app, over the last year, in hopes to make it easier for you to connect with businesses looking to give food a second chance. If you want to see those listings only in your area, all you need to do is click on ‘Location’, put in a city or postal code, and then click on apply; this allows you to conveniently see all those listings available in that location. 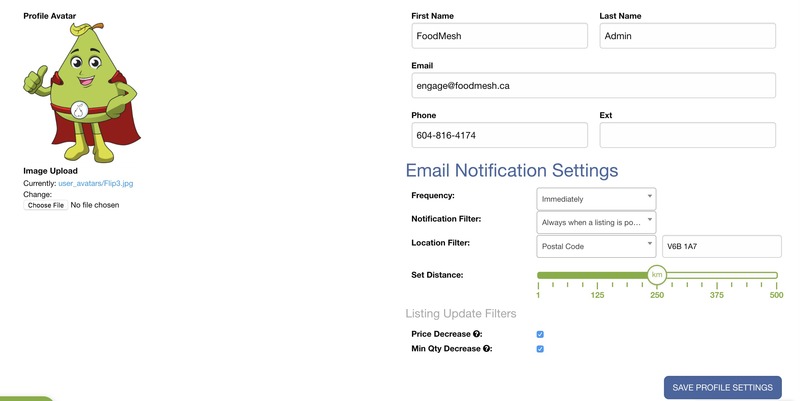 In addition to being able to filter listings on FoodMesh, you can also change your notification settings to only see those listings you are interested in based on a specified location. This can be changed in ‘My Preferences’ by clicking in the top right corner of the page. Creating the Dashboard allowed us to give you a convenient overview of your company’s activity on FoodMesh. After some tweaking, and a few iterations, we have made it so you can see your latest messages, latest orders, a brief summary of listings, updates on FoodMesh, and much more. The future of the Dashboard will involve adding new report options and allowing you to customize what you see, based on your company’s needs. This October, we have some new things coming to FoodMesh. The latest being the implementation of a Public Marketplace, which gives the public a teaser of what is available on FoodMesh. This was built to bring more connections to FoodMesh, which allows for a greater chance of giving surplus food the second chance it deserves. If a supplier would like to opt out of this opportunity, they can contact us at engage@foodmesh.ca to get the step by step information on ‘How to Opt Out’. FoodMesh is not the same as it was 1 year ago; I have seen this platform grow into something new and exciting, and I know it’s not done growing. You can help the FoodMesh community grow even more, just by sharing this message with others you know that could have an interest in joining the FoodMesh network. Let’s build a community together, let’s make a difference together, and let’s reduce food waste by giving surplus food a second chance. 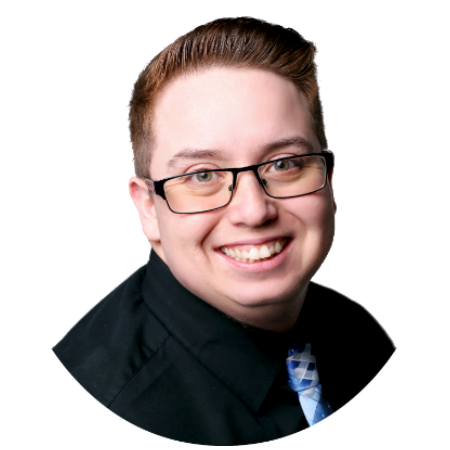 Jacob McCrae joined the FoodMesh team in June 2017 as the Front End Web Developer. Over the last year his role has evolved into Full Stack Web Developer, where he is touching almost every part of the system and responsible for making the updates to the platform and implementing new features. 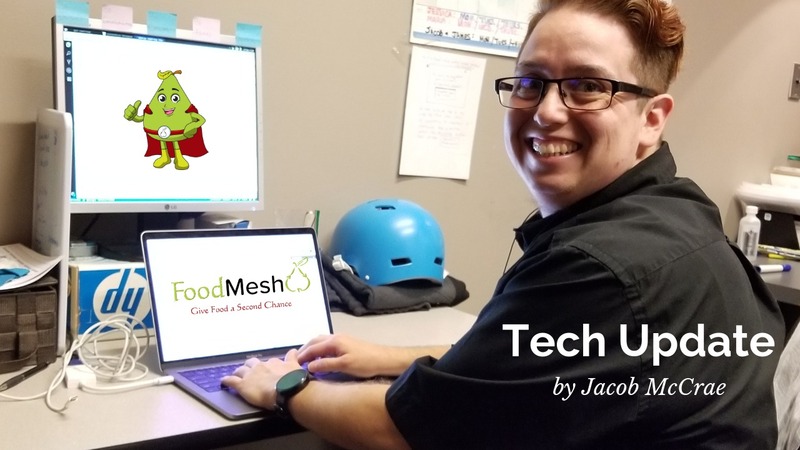 He joined FoodMesh to be a part of making a difference in our world and FoodMesh’s vision has inspired him. He seeks to make an impact by living the best version of himself, regardless of the obstacles in his way; and he loves to encourage others to do the same.